All transactions are safe and secure with a reliable history in online purchasing behind each of our associates. Buy the Wawaweewa! t-shirt to own Borat clothing and merchandise. Some people say "yippie" when they're excited, others say things like "sweet" or "awesome." Everyone's favorite Kazakhstan journalist, Borat Sagdiyev, uses the expression, "Waa Waa Wee Waa." 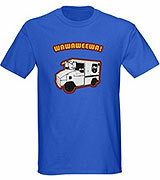 The front of this Borat tee features the Kazakhstani journalist's ice cream truck, surrounded by his favorite expression that he uses when he is surprised or impressed, "Wawaweewa!" Purchase this design on a Borat hat. In addition to the Wawaweewa! tee above, browse the Borat Clothing Gallery for more apparel like men's and women's clothes, kids shirts or hoodies.